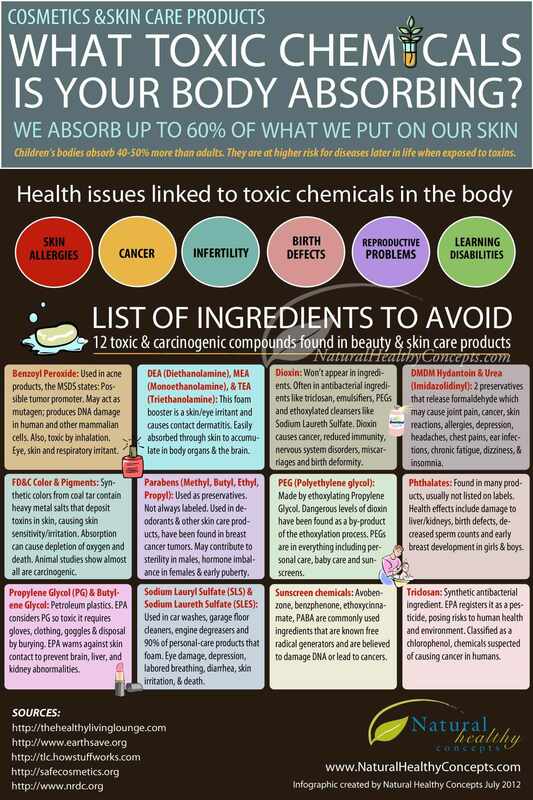 What Toxic Chemicals Is Your Body Absorbing? It's not only what you put inside your body that affects your health - the stuff we put on our skin and hair can be harmful or helpful as well. You may be surprised to learn about the potentially toxic ingredients found in many of the health and beauty products we use every day. These toxins are linked to detrimental health concerns - from cancer and infertility to birth defects and learning disabilities. Our infographic explains what these toxins are and in what types of products you're likely to find them. Lotions and sunscreens, cosmetics and shampoo - what is your body absorbing? There are more natural health and beauty options available.